Swallowing tapeworms, the beauty fad that continues to haunt us. Victorian women had very restrictive beauty standards. From horrifying foot-binding practices in Imperial China to life-threatening surgeries in modernity, humanity has been finding harmful ways to modify the body since the dawn of civilization. The Victorians were no exception to this. The Victorian era, roughly the 1830s to 1900, is notorious for its bizarre notions of beauty and its even more bizarre secrets to attaining it. The ideal of the time was modeled after those afflicted by consumption (tuberculosis). Pale skin, dilated eyes, rosy cheeks, crimson lips, and a meager and fragile figure. 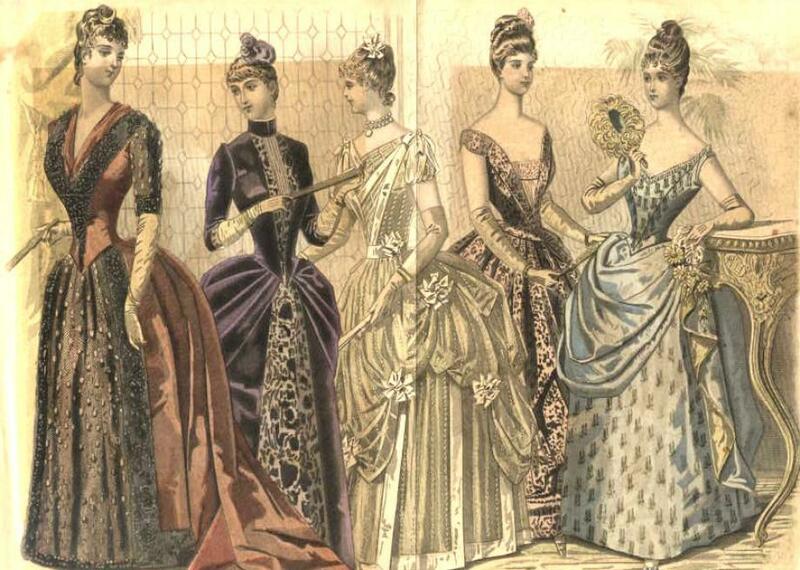 From swallowing ammonia to bathing in arsenic—which they knew to be poisonous—to using figure-molding corsets in a never-ending quest for the “perfect” 16-inch waist, there was no limit to what fashionable Victorians would do. 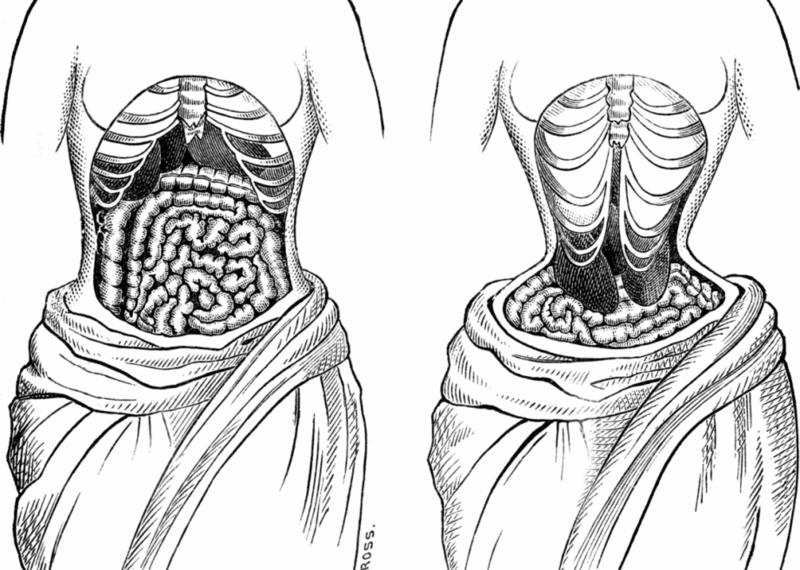 An illustration of what Victorian doctors believed to be the consequence of tight-fitting corsets. Most of these practices have, thankfully, gone out of style. We no longer swallow ingredients present in rat poison, and corsets no longer disfigure women’s internal organs. There is one gruesome dietary idea, however, that has managed to survive—the tapeworm diet. The idea is simple and gross. You take a pill containing a tapeworm egg. Once hatched, the parasite grows inside of the host, ingesting part of whatever the host eats. In theory, this enables the dieter to simultaneously lose weight and eat without worrying about calorie intake. Both ideas fit nicely into Victorian ideals, as illustrated by The Ugly-Girl Papers by S.D. Powers, one of the most popular beauty guides of the era. First and foremost, the guide states that “it is a woman’s business to be beautiful.” Beauty takes time and effort, and no plain girl could forego the tediousness of beauty regimes if she wanted to find a husband. One can therefore conclude that Victorians were very much willing to make sacrifices to attain ideal beauty. If stout, [a girl] should eat as little as will satisfy her appetite; never allowing herself, however, to rise from the table hungry. The tapeworm diet may thus have been the perfect solution. Allegedly, a woman would never rise hungry from the table, yet she would continue losing weight. All concerns for health and discomfort could be dismissed with the claim that beauty is pain and sacrifices must be made. Luring a tapeworm out with a bowl of liquid has been a common technique in different cultures. And sacrifices were most certainly made once the desired weight was achieved. To get rid of the now-unnecessary parasite, dieters would employ the same methods as those unwillingly afflicted by the worms. In Victorian England, this included pills or special devices. One such invention, created by Dr. Meyers of Sheffield, attempted to lure the tapeworm by inserting a cylinder with food via the digestive tract. It comes as no surprise that many patients choked to death before the tapeworm was successfully removed. Other folk cures prescribed holding a glass of milk at the end of either orifice and waiting for the tapeworm to come out. Whether this actually holds any validity remains an issue of debate, as we have yet to prove that parasites have a preference for bovine lactose. What’s scariest about this diet is not that it may have been used by the same people who willingly ingested carbon but that its idea continues to be around. Like air pollution and zombie films, it simply refuses to die. Its presence is evidenced by the numerous online forums dedicated to the question of the diet’s efficiency, and the (fairly dubious) reports of Mexican clinics that will give you the treatment for a couple thousand dollars. With both Victorian and modern dieters, the actual popularity of this radical diet is murky. Historians disagree on whether people actually ingested tapeworm pills or whether the advertised products were simply placebos meant to dupe desperate people. Likewise, reports on Mexican tapeworm clinics are hard to believe, as are most of the testimonies of its advocates. Moreover, rumors of stars like Maria Callas losing weight with the diet have often turned out to be simple manipulation of facts. It seems, then, that at no point of its history has the tapeworm diet been an actual fad. This doesn’t negate, however, that there are people willing to try it. If the “tapeworm pills” of the Victorian era were indeed a farce, it does not change the fact that people bought and swallowed them in the hopes that a gigantic worm would live in their digestive system. Likewise, a simple Google search on the diet will pull up dozens of diet blogs that cover the topic. The comments sections will take you on a sadly humorous trip full of obvious scams and willing participants asking for more information. Even reality TV star Khloe Kardashian suggested that she wanted to get a tapeworm on Keeping Up With the Kardashians. The statement evoked an article from Vice on the legitimacy and dangers of the diet. Claiming concern for public health, the Food and Drug Administration has officially banned tapeworm pills. Unrealistic expectations of female beauty, it seems, retain their parasitic grip on pop culture.